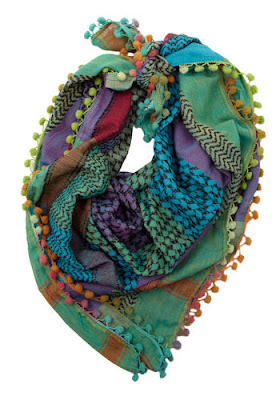 Beth's Super Awesome Blog: Scarves for Spring! I'm so glad that more & more people are wearing scarves in the spring / summertime. I got this one from ModCloth a couple of months ago (my most favoritest webstie ever! ), and it's light enough to wear during the warmer months. I love all of the color, and especially the PINK! Um, yeah, I kinda like that color. Didn't you notice? Purple too? I actually ordered yet another colorful scarf from ModCloth yesterday... ugh - what was I thinking? It's going to be really super cute though. Something about wearing scarves with tank tops makes me so happy.... while at the same time feeling ironic. Love it! 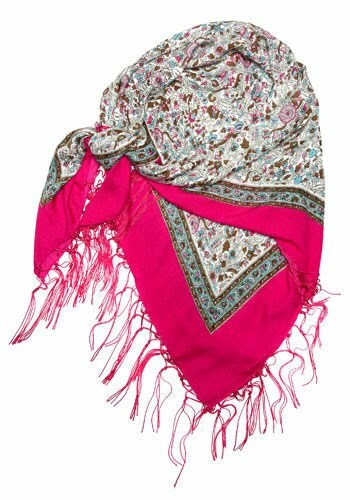 And here's a picture of the scarf I just ordered!